Exclusive interviews and briefings from officials from the Kiryat Malachi apartment where a Gaza rocket killed three civilians. Operation Pillar of Defense is the IDF’s action to cripple the ability of Hamas and the other terrorist organizations in Gaza in order to prevent their incessant rocket and mortar attacks on the civilian population of Israel. Walter's World brings you an eyewitness report on life in the south of Israel, which is under constant rocket attack. In particular are interviews from the destroyed apartments in Kiryat Malachi, just four hours after the Grad rocket struck the building in which three people lost their lives and several were injured, including a baby who is fighting for its life. For the full podcast download the latest episode of Walter's World by clicking here. 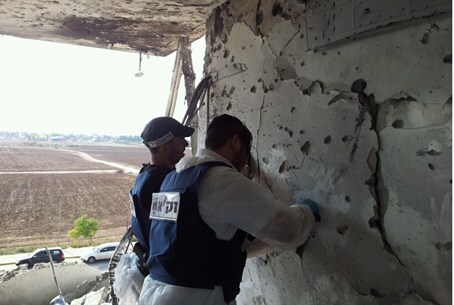 Yedidah Halevy, ZAKA Commander and volunteer in Kiryat Malachi, who attended to the fatal missile attack in which three Israelis were killed stated, “I live in the adjacent street to the building which received a direct hit. I heard the explosion and ran in the direction of the smoke. Other ZAKA and MDA volunteers arrived with me at the scene. We began to treat the injured. To my sorrow, two men and a woman were killed on the top floor of the building. The apartment suffered a direct hit, with shrapnel throughout the rooms. ZAKA volunteers continued their sacred work of dealing with the bodies and collecting human remains, despite another Code Red alarm,” he stated. Assessments were given by both the colonel of the IDF Home Front Command of the southern district and the National Police spokesman Micky Rosenfeld. Statements were issued by Minister of Public Diplomacy Yuli Edelstein and British Ambassador Mathew Gould, both of whom addressed a group of foreign journalists in front of the damaged building. Interviews were also conducted with Ashkelon's Mayor Benny Vaknin at the operations room deep under the municipality building of Ashkelon. The some residents of that city spoke their mind as well. All photos courtesy ZAKA emergency medical services. Walter Bingham was born in Germany. Just days before the outbreak of WWII, with the help of a Zionist youth movement he was selected for a place on the "Kindertransport" to Great Britain. He currently resides in Israel. Walter's World broadcasts every Sunday from 5:00 p.m. to 6:00 p.m. For podcast archives click here.